"It was such a joy for us to work with Abby! As a photographer and photographer educator, Abby had so much wonderful content to share. It was exciting to create a detailed, engaging design - while keeping her content user-friendly for her diverse prospective clients!" "Working with With Grace and Gold was one of the best choices I could have made! These ladies absolutely nailed it! From start to finish, they were so helpful and responsive - and I couldn’t believe this gorgeous new website was mine! I feel like I have a complete brand that will allow me to grow my business in a strategic way - and allows people to see who I truly am!" 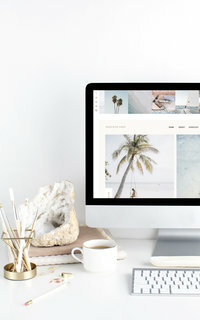 "Prior to my rebrand I was nervous because I­t­ was something I had never done before, and I wasn’t 100% sure of exactly what I wanted my website and brand to look like." To raise her prices confidently. To create an organized, seamless "home" for her services. To be seen as both a photographer and an educator. Abby Waller is a Tampa, Florida and Atlanta, Georgia-based photographer and photographer educator with a heart for sweet southern clients!